Welcome to Harmony Farms! My name is Novi, and since I am the "Head of the Herd", I get to introduce you to all my friends. 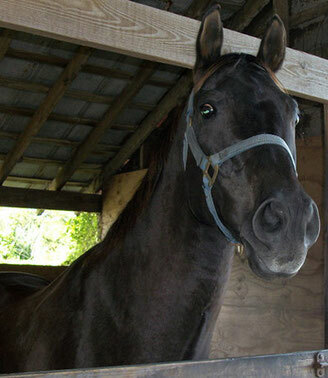 I am NOVI, a chocolate brown gelding who is 15.3 hands. Everyone thinks I am the handsomest horse in the barn and I agree! All the mares love me! I lived in Wisconsin before coming to Florida in 2006. Did some shows, trail rides and best of all, I was a therapy horse for 5 years! When I came to Harmony Farms, Pepsi appointed me as second in command of the herd! He recognized that I was Johnny on the spot when it comes to checking on everything! Now I am the HEAD OF THE HERD. This is one tough job! I have to check on where everyone is at all times, watch the traffic outside the gate to be sure the area is secure, check out any new horses coming into the herd, keep the girls in line and still do my work for lessons! Wow, just listing all my jobs makes me exhausted! I'll tell you what else makes my job hard, Spud & Duke! They want to play all the time, and run around like there was nothing else to do. Come on guys, get serious! I know, it sounds like a sissy name, but this guy is no sissy! True (as his friends call him), is my old stable mate from my days at the barn in Melbourne with my former owner. I remembered him the minute his hoof hit the ground at our barn! 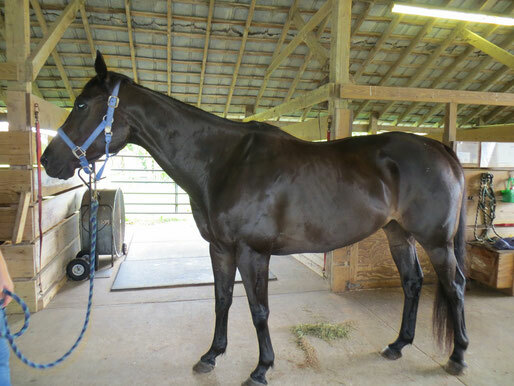 He is a big, big boy, 16.1 hands, with a dark chocolate coat (similar to mine!). Although he is only 12 years old, he is pretty smart and well trained. He is a Thoroughbred. You know, like the ones that run in the Triple Crown races. He reminds us of that all the time. Hey True, if you never raced, you are not race horse! Just a subtle reminder. That is one of my jobs as head of the herd, keeping all these egos in check! It is a tough job indeed. Anyway, so far none of the mares have gone ga ga over him, except Sweet Pea, but she goes ga ga over every guy that comes in here! He just seems to like everyone and that is fine with me. He will fit in well with our riding program because we have some tall riders who need a bigger horse and Mr. Valentino will do quite nicely. Glad to have my buddy back! Emily belonged to a very special lady who passed away in 2004. Her fondest wish was that Emily would go to live at Harmony Farms and help people. And she did just that. She is very gentle and nice to look at too, if you know what I mean! She is now Spud's girl, but sometimes she acts like she likes all the boys. I don't know what gets into her when that happens??? Spud doesn’t like it too much and then he chases all of us away, like it was our fault! What a grump! She still catches my eye once in a while. For an older lady, she still looks pretty cute! He was a show horse and he has been everywhere. Oh the stories he tells. He is 16H, which is bigger than me, but who cares! He's pretty quiet most of the time except at turn out in the morning. Boy, can he run! He is now in the smaller pasture with Blondie. They call him the babysitter horse. He treats Blondie like a Princess, but he gets a little too possessive sometimes if you ask me. She is not a baby you know! I guess he means well because everyone loves him for it. He is not too big, just 14.2h, and I think he could lose a few pounds! Run around the pasture more, Duke and work off some of that fat. That will get him moving! Since Dub arrived, Duke likes to hang out with me & her! They call us the Three Amigos and usually say something like "Here comes trouble" when we head to the gate! 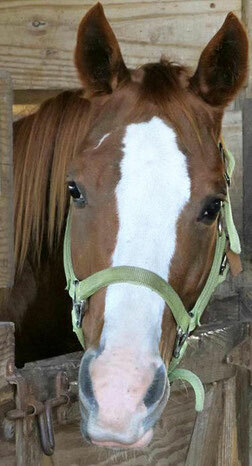 Duke is lots of fun in the pasture and he likes to play games with me; like pulling off each others fly masks! Oh Boy, what fun. The humans get upset with us though! He was donated by one of our volunteers and her kids. They hoped he would work out for us and they were right. Thank you Gettlemen family. What kind of a name is that? Sounds like Hocus Pocus, if you ask me! 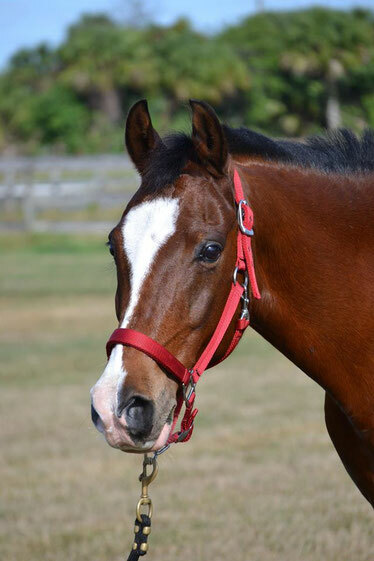 He is an Appendix (QH/TB cross), 15.3 H, Sorrel gelding. The girls all love him! He is really nice, and guess what he did before.......he was a Polo Horse!! Wow, now I am impressed. He can really run, but he is still scared of some of the stuff in the arena. Like the basketballs, and the big green ball! Guess he never played basketball on the Polo field! LOL! Meet Double Trouble otherwise known as DUB! I thought that Soda Pop was big, but Irish is gigantic! Well, not really, but he is 16.1H and big all over. Good thing he is so easy going, or I would be getting pretty nervous! I don't usually like new guys coming into the herd, but Irish was in the pasture for almost an hour before I knew he was there! Talk about quiet! He likes everyone (yeah right! ), and never starts a fuss. I call that pretty dull, but the humans say that is a good thing NOVI! Are they trying to tell me something? Oh Boy, I knew he was trouble from the day he arrived. He likes my mares a little too much! The humans are always yelling at him for jumping on the mares! I don't know what that is all about, but I know he gets in trouble for doing it. The first thing he did was to steal Emily away from Pepper! Now Pepper doesn't like either one of them. Such drama! 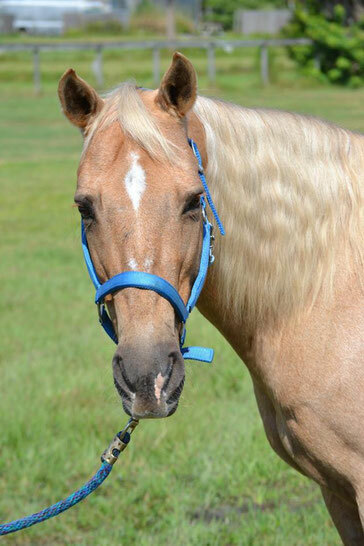 Everyone says he is so handsome with his Palomino coat and wavy mane, yeah, yeah. Heard it all before. He is not tall, dark and handsome like me and that is all that matters! I have to keep reminding him that I AM IN CHARGE! I am going to keep an eye on that guy! I know I heard the Boss Mare say more than once, "We will never have an Arabian therapy horse"! Well, guess what? now we do! Devon is a pretty flashy guy, I guess you could say he is handsome, but I am not going to say it! He was a bit wimpy when he arrived, even hiding behind Shy for protection, but lately, he has become pretty brave. He refused to leave the water trough when Dub walked up! Nobody does that, except for me. And she let him! Don't know what got into her. He is pretty noisy in his stall too, always banging for attention and food! I bet he learned that from Duke. He acts pretty goofy lots of the time and the humans say he does not act like an Arabian, more like a Beagle if you ask me! Anyway, Shy seems to like him and so does the rest of the herd, so I am happy to have him as part of the team. His riders really like riding the fancy Arabian too. 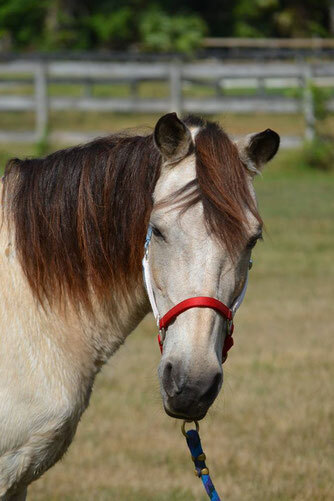 This cute little mare sure is a looker! The day she arrived, she stood up to all the boys along the fence line letting us know who was boss. She is one tough. cookie. And, she can move! She and Dub had a run around the second day she arrived and she left Dub in the dust! Ever since that day, she has been in the #3 spot in my herd. 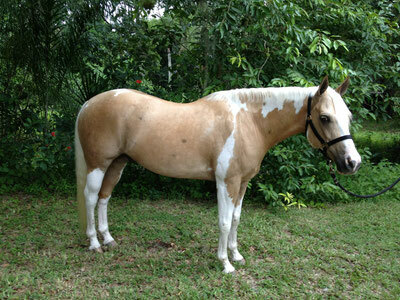 She is a large pony and moves smoothly for her riders, which is why they love her. I can tell she is very smart and wants to check everything out all the time. She fit in just fine with our bunch and likes to run with us when we get crazy and run all over the pasture. Whew, even I have a hard time catching her, and I am the HEAD of the herd! 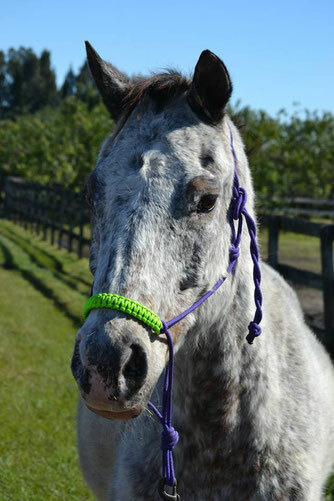 PLEASE NOTE: We do not provide or offer riding for the non-disabled, trail rides, or birthday parties.